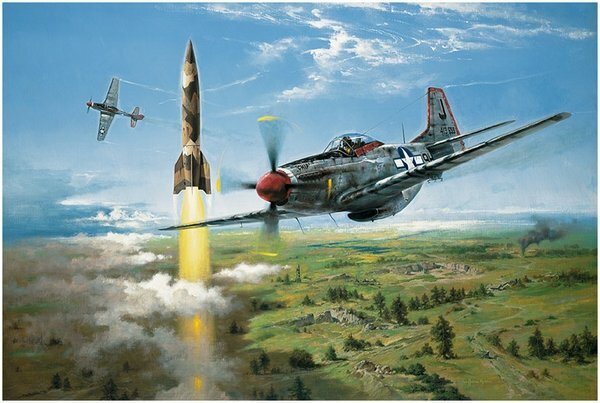 Overall Size: 20" x 28"
A pair of North American Mustangs from the 1st Scouting Force, 8th Air Force, with P-51 D Chip flown by Merrill Dewey DuMont in the foreground, detects a German V-2 rocket launch site near the English Channel in the spring of 1945. The V-2 units were mobile and could be deployed quickly in open countryside or city suburbs, they were all heavily defended and thus hazardous to attack. The scouts would radio back information on the location, weather conditions and defences etc. in order to aid allied bombers in attacking these sites.